Here is the report from Barbara Vauthier and Zy Weinberg's excellent newsletter Foodlinks America, which is available for free from the TEFAP Alliance. Although Congress has begun working on a 2007 Farm Bill that will guide federal agriculture and food policy into the next decade, it is uncertain whether a final bill will be completed this year. The House of Representatives passed its version of the bill on July 27, 2007, but action has yet to be scheduled in the Senate. Little progress is expected in revising commodity program payments, one of the more controversial aspects of the Farm Bill and a possible source of funds for new priorities. After the House essentially maintained the status quo on commodity payments, the momentum for change in the Senate began to fizzle. “Political expediency trumped moral responsibility in the House’s vote on the Farm Bill,” commented Reverend David Beckman, president of Bread for the World, a Christian lobbying organization in Washington, D.C. “In the end, the House made only cosmetic changes to the outdated commodity payment system. While obviously disappointing, the passage of the House’s version of the 2007 Farm Bill is by no means the end of the push for broad reform,” said Beckman. Also potentially complicating the Farm Bill picture in the Senate are World Trade Organization (WTO) issues. The potential need to settle costly trade disputes through the Farm Bill may add financial pressures. It was reported on August 29, 2007 that agricultural trade talks under the WTO, stalemated for almost six years, may resume and move forward in early September. The WTO “could actually blow this whole thing up,” Representative Collin Peterson (D-MN), chair of the House Agriculture Committee has warned in reference to world trade and the Farm Bill. A reduction of up to $16 billion annually in “trade-distorting subsidies,” like commodity program payments, could be required of the U.S. in WTO rulings. A bill that would require nutrition information on menus in chain restaurants in California cleared a key legislative hurdle today, passing in the state Assembly’s appropriations committee. SB 120, which passed the full state Senate in June, would require chain restaurants to list calories on menu boards and calories, saturated and trans fat, sodium, and carbohydrates on printed menus. Health advocates are urging passage of the bill when it comes before the full Assembly in early September. 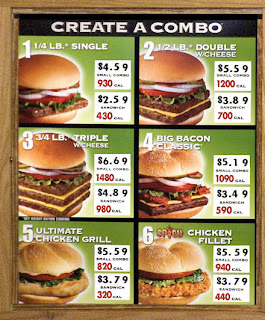 CSPI recognizes that, to make the case for menu labeling, it must overcome concerns about feasibility, cost, and the sense that there would be too much mandatory information on the cluttered menu boards. Though that's a big challenge, their clever graphic artists continue to come out with more convincing photoshop examples of how it could be done well. U.S. Food Policy is experimenting with video. This post is really the second attempt at a video blog post (readers using RSS feeds, please forgive us). Episode 1 is about the September Eat Local Challenge. After years of delays, labels for a wider variety of foods -- including beef, lamb, pork, perishable agricultural products, and peanuts -- are set to become mandatory by September 2008. A bill passed by the US House of Representatives in early August is expected to be taken up by the Senate and signed by President Bush with few revisions. But despite the long-awaited regulations, plenty of food still will not carry country labels. Consider poultry. Because opponents of the legislation were so strongly against requiring country labels and so little imported poultry is sold in the United States, legislators exempted it to avoid jeopardizing the bill, said a staffer at the US House Agriculture Committee. Then there are the labeling law's quirks. For example, jalapeno peppers sold fresh will have to be labeled. But if they're sold frozen as "poppers" -- wrapped in a jacket of breading with cream cheese filling -- they will be exempt. And a laundry list of countries are likely to grace various hamburger labels, owing to the multitude of countries that send beef here for processing. But if that same beef is used as an ingredient in a Marie Callender's frozen dinner, for instance, the dinner's maker -- ConAgra Foods -- will not be required to note the country of origin. Opponents have seized upon what they call the arbitrary nature of the legislation. Why pigs and not poultry? Why green peanuts but not peanut butter? Unfortunately, mandatory COOL is an example of a task that is difficult for government agencies, and which might be better addressed with market tools. Economists tend to think that, if consumers really want to know about country of origin, an entrepreneur whose product comes from a preferred country (U.S., for example, or New Zealand) will probably find a profit-making opportunity to provide that information voluntarily. Once some sellers provide this information, consumers will catch on that meat without labels probably comes from a less-preferred country. At present, the economist's view in its purest form would be naive. There is strong survey evidence of consumer desire for country information, and yet insufficient voluntary labeling. Perhaps the best role for the government would be to break down some of the existing institutional barriers to better flow of country-of-origin information. Some of these barriers may be generated by meat industry trade associations. Perhaps some public funding for tools and systems to provide food brands with information about the country of origins used by their suppliers would be a better option than putting government agencies in the position of making difficult decisions about exactly which products should or should not be subject to mandatory COOL. I point out the possible shortcomings of mandatory COOL with some hesitation. It is tempting to bite my toungue on grounds that anything the American Meat Institute hates must have some merit. The main impact of mandatory COOL, even if it were bad policy, would be to raise the costs of meat slightly and increase consumer awareness that some of their meat comes from unsafe sources. The consequences of doubtful policy on this issue might be better nutrition. But that's faint praise for mandatory COOL. YouTube has Peter Jennings' report in 2004 or so about obesity in America. It differs from most mainstream reports by portraying more starkly the role of government policy and food industry marketing. Consider this exchange between Jennings and a marketing guy (who wasn't clearly identified that I could see). Jennings: When you're putting together an advertising campaign, do you care whether the product is healthy or not? Response: I care that the product has a positive role in a child's life. Jennings: But you know what's less healthy. You know where asparagus and soda pop line up. Response: You are absolutely correct that I am not going to get the same return on investment for a client advertising asparagus and spinach to a kid as advertising some of the so-called less healthy products to a kid. Guilty as charged. In a sense, one has to be sympathetic to the marketing guy. His advertisements are entertaining, and the products do bring a certain joy to a child. His client does expect a profit from its investment in advertising. There is no point in blaming an entrepreneur for seeking a profit. But, realistically, we should lower our hopes that public-private partnerships can address the problem of obesity in a constructive way. Two more promising avenues for constructive change are better public policy and a cultural change among parents and other caring adults, as they come to see more clearly what a vigorous defense they must mount if they hope to influence their children's food choices in this marketing environment. CARE, one of the world’s biggest charities, is walking away from some $45 million a year in federal financing, saying American food aid is not only plagued with inefficiencies, but also may hurt some of the very poor people it aims to help. CARE’s decision is focused on the practice of selling tons of often heavily subsidized American farm products in African countries that in some cases, it says, compete with the crops of struggling local farmers. The charity says it will phase out its use of the practice by 2009. But it has already deeply divided the world of food aid and has spurred growing criticism of the practice as Congress considers a new farm bill. NYT reporter Celia Dugger has been on the trail of this story for many months. 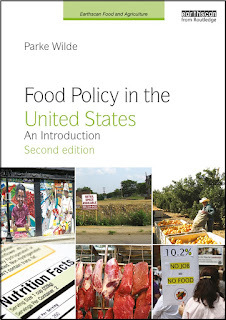 Last week's article quotes Daniel Maxwell, formerly of CARE and now at the Friedman School of Nutrition at Tufts, who co-authored an important book on food aid with Chris Barrett in 2005 and has continued to write on the topic. Ultimately, CARE’s decision to phase out such sales evolved from a senior manager’s change of heart. Daniel G. Maxwell, a professor of nutrition at Tufts University, was a food security adviser for CARE in Nairobi who saw sales of American food as an imperfect, but useful way to raise money. He knew firsthand, however, how risky it was to manage projects financed in fluctuating commodities markets. When prices sank, CARE had too little money and was sometimes forced to lay off workers. Mr. Maxwell said he also strongly suspected that buyers had offered too little for the farm goods, knowing they were dealing with aid workers who were novices in commodities trading. Food aid gets a free ride, politically, because of a "halo effect." How could a gift of food be a bad thing? But some poor farmers around the world don't want our gifts. They want to earn a fair price selling us their products. And even non-farmers in poor communities around the world may be harmed by food aid in some circumstances. In food aid's favor, one must consider the depth and urgency of the need for assistance; on the other side of the ledger, one must consider that food aid may suppress demand for local farm production, and the local production may increase demand for the goods and services of other local families even if they are not farmers. Here is more information about CARE. Dr. David Schwartz, the director of the federal government's institute overseeing environmental health issues, is stepping aside temporarily while senior officials review his embattled program, according to an Associated Press report (via Guardian Unlimited). The National Institute of Environmental Health Sciences (NIEHS), part of the National Institutes of Health (NIH), addresses environmental toxins and their health consequences. The public health blog Effect Measure covers the controversy in full, including Schwartz's recent letter to staff announcing his stepping aside, an earlier controversy over his effort to outsource the institute's flagship journal Environmental Health Perspectives, Congressional inquiries into Schwartz's initiatives, and his effort to address conflict-of-interest rules he perceived as unwise and personally disadvantageous. Peter Menzel's wonderful 2005 book, Hungry Planet, shows photographs of families around the world posing with their food supply for a week. A less expensive softback version comes out in September. A selection of the photographs is on display at Time. These photographs carry a message for us. I fear it might be a reprimand. The Public Health Committee in the Massachusetts legislature last week gave its approval to an important school nutrition bill, according to an email circular from the Massachusetts Public Health Association (MPHA). The Public Health Committee gave its approval to H. 2168, "An Act to Promote Proper School Nutrition.” The bill benefits from revisions that should ease its passage – charging the Department of Public Health with writing standards that reflect new guidelines issued by the Institute of Medicine. The MPHA says that now is the right time to let your representatives know your thoughts on this bill. The proposal has been revised to more closely follow the recommendations at the national level in a recent report from the National Academies. The Boston Globe also reported on this bill and related legislation this week. I started reading the Sugar Mountain Farm weblog from time to time after the eccentric, eclectic Vermont farmer Walter Jeffries commented at U.S. Food Policy. In 1935, Post cereals licensed the rights to a popular new movie character, Mickey Mouse, and thus the marketing of kids' food changed forever. Mickey was placed prominently on Post Toasties cereal boxes and sales soared. 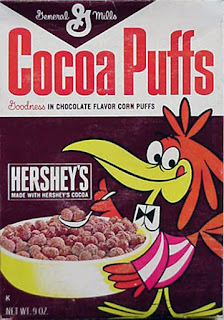 Other manufacturers jumped on the character marketing bandwagon and the kids' food business as a whole took off. Goodsell keeps a cool weblog called a sampler of things and has a fascinating online archives of classic food marketing images. The increase in ethanol production from corn is not the only reason for rising food prices, Helen Jensen and Bruce Babcock point out in a recent article from Iowa State University. Some observers have been concerned that demand for biofuels will bid up prices for food uses of corn, with especially bad consequences for the price of meat and dairy products that use corn as feed. Jensen and Babcock don't dismiss this concern entirely, but they put it in perspective by noting the comparatively small contribution of corn to final meat and dairy prices and the wide variety of other supply and demand factors that influence these prices. The authors cite recent analyses suggesting that a 30% increase in the price of corn might raise egg prices by about 8%, beef prices by 4%, dairy prices by 3% and total food prices by 1%. I might point out a flip side of this comparatively unconcerned perspective on high corn prices: it suggests that farm subsidies that lower corn prices probably have not been helping consumers much either, as subsidy supporters claim. And finally, food price increases, from whatever source, will directly affect the cost of U.S. nutrition programs. Higher commodity prices combined with shrinking inventories mean that the U.S. government will be forced to pay high market prices for food for school lunch programs. And the automatic food price escalators built into the food stamp program mean rising expenditures there. The silver lining, as far as the federal budget is concerned, is that at least a portion of the higher costs of nutrition programs will be offset by lower support payments for farmers because of high commodity prices. The Consumer Federation of America's annual National Food Policy Conference will take place Sep. 27-28 in Washington, DC. The program (.pdf) includes breakout sessions on food safety, childhood obesity, biofuels, and nutrition policy in cities and states, plus keynote speeches by leading Farm Bill figures, House Agriculture Committee chair Rep. Collin Peterson (D-MN) and Agriculture Secretary Mike Johanns. Two years ago, I enjoyed participating in this conference as part of a debate with Ken Cook of the Environmental Working Group, former U.S. Congressman Charlie Stenholm (D-TX), and David Beckmann of Bread for the World. An article in the Colorodoan rightly warns that we should never stress young kids out with weight loss dieting. But the headline -- Too Young to Diet? Some Say Fight Against Childhood Obesity Has Backfired -- gets the story wrong. Let kids be kids! The best way to teach healthy eating and physical activity for a lifetime is to provide a nurturing environment with healthy food choices, plenty of time for outdoor play, and some degree of shelter from an onslaught of television, sedentary distractions, and unhealthy food and soda marketing. That's the real fight against childhood obesity, and it certainly hasn't backfired. The blogspotting column in the August 13 issue of BusinessWeek has a kind word by Michael Loeb about U.S. Food Policy (p. 14, apparently not online, or not yet). The weekly newsmagazine enjoyed our Farm Bill coverage, which is heavily indebted to reporting at weblogs like Mulch and Ethicurean and the news summary at FarmPolicy. Of course, FarmPolicy in turn relies heavily on quotes from original reporting in the major national, regional, and industry-specific newspapers and newsmagazines, as well as online sources. I could not possibly read all those sources myself. In addition to the hard work of blog veteran Keith Good, FarmPolicy also has contributions of policy analysis by Dan Morgan, who I associate with the Washington Post's stellar coverage of agricultural policy. FarmPolicy has support from the German Marshall Fund, where Good and Morgan each have a fellowship. Most articles in the Post have generous automated links back to related blog commentary. Like BusinessWeek, many other traditional news sources now cover online sources almost as their own beat. For all the tension between new and old media, which I follow with interest on BoingBoing, the adjective I would use to summarize the traditional media's attitude toward new media is gracious. For many years, leading voices have been warning about conflicts of interest in nutrition science and the dietetics profession. One reads the work of Marion Nestle (.pdf) or, more recently, Catherine Woteki with considerable alarm. The main rebuttal to these concerns has been that most nutrition and dietetics professionals are sufficiently honorable to tell the truth, without being influenced by their funding source. In this view, full disclosure and professional standards are sufficient to prevent conflicts from doing any harm. There is no need for further action or policies to limit conflicts of interest. New empirical evidence shows that the funding source does appear to influence the conclusions of published scientific research in nutrition. This evidence appeared in a January article in PLoS, by Lenard Lesser, a young doctor and medical scholar now a resident Tufts. His coauthors are Cara Ebbeling, Merrill Goozner, David Wypij, and David S Ludwig. A key table shows: (1) research conclusions were favorable to a food product in 64% of the 22 articles funded by industry sources who benefit from sales of that food product, (2) research conclusions were favorable to a food product in 46% of the 52 articles with no industry funding one way or the other, (3) research conclusions were favorable to a food product in 0% of the 2 articles funded by industry sources that compete with sales of a food product. Industry funding of nutrition-related scientific articles may bias conclusions in favor of sponsors' products, with potentially significant implications for public health. Suppose you were a public relations staffer under contract to A&W, a fast-food hamburger chain owned by Yum brands. Would you really think U.S. Food Policy is a promising source of free publicity? I remember one morning I was up early and was randomly watching cartoons and the commercials were quite frightening. Sugar! Toys! Sugar! Candy! Toys! I'm also working with MoovetoAmerican.org, a group asking Americans to "Moove to American" and support 100% US beef. I appreciate your point of view. Thanks for the great post. Join the Moovement! Support American Beef. Gotta love the subtle pandering to your pro-nutrition sensibilities with the opening paragraph about sugary cereal marketed to children. Rebecca's comment was to this post, which was followed up by this post and this one about the limits of voluntary corporate policies on food marketing to children. That's a great story line for A&W to join. Similarly, with regard to real 100% American beef, the A&W folks may enjoy U.S. Food Policy's coverage of Country of Origin Labeling (COOL). Tana at I Heart Farms has more on this story, in a post entitled "Moove Your A-- Out of Here, Evil Marketing Idiots."